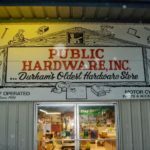 Durham’s oldest hardware store! Family Operated since 1924. Like our slogan says, if we don’t have it, can’t get it, or know where to find it, then you don’t need it.